Ahh, fall. The pumpkins are ripe, the leaves are changing color, football is in-season, and Halloween is fast approaching. It’s a lovely time of year. That is, unless you’re brand-spanking new to the area and have no idea who anyone is or where anything is located. For many military families, fall is the time of settling into their new digs at their new duty station. But adjusting to your new neighborhood can be hard! To give you some ideas on how to settle into your new neighborhood, we’ve drawn inspiration from some of our favorite Halloween movies to get you started. As a Potter fanatic, I’d be remiss if I didn’t immediately think about the Halloween scene from Harry Potter and the Sorcerer's Stone. The Great Hall tables, overflowing with treats, sweets, and tasty food for all? Doesn’t that sound like the kind of event your family wants to go to? Get connected with the base spouse groups on Facebook, as well as your unit’s Facebook group (if they have one). While these pages can be a little dramatic (like Quirrell bursting in an announcing there was a troll in the dungeons...), they’re bound to have great information on local events in the area that you otherwise might not know about! That’s where MeetUp can be a great companion for milspouses. On their website, you can search for a wide variety of groups that get together in the local community. It makes finding the people who also enjoy scaring the crap out of other people a lot easier. Sometimes the best way to learn about local must-see, must-eats, and must-dos (like the Witch’s Kitchen in Paranorman...best pizza in town!) is to set up a Pinterest board for your new base! Not to burst your bubble, but there are tons of people who have already walked the path you’re on. The good news for you is that many of them pinned about it, making it easier than ever to collect ideas for your weekend activities with your family. Check out these boards and see if one already exists for your duty station! Just as you’re settling into an unfamiliar area, so are your kids. While the idea of searching out more children may make you weary, it’s important you do your best to help your offspring adjust, too. And what better way than finding playmates? Take a page out of Mary Sanderson’s beloved book Hocus Pocus and sniff out some opportunities for your kids. Maybe this is a club sports team, a local playgroup, a Boy Scout or Girl Scout troop, or a religious community. It really doesn’t matter, as long as it works for your kids and your family. And just think, driving them all over kingdom come will help acquaint you with the area while your broom is out of commission! Not all of your neighbors are going to be as outgoing or...peculiar...as The Addams Family. And hitting golf balls into your neighbor's morning cereal? I recommend leaving that introduction tactic to Gomez. Look, we’re not saying you need to come up with your own quirky research methods like Ichabod Crane from Sleepy Hollow. But we are saying you should take a few moments to take advantage of the amazing resources that are already available at your fingertips! Visit the MILLIE website to find your duty station and then read up on the local neighborhoods. Filled with useful information on the area, you’re bound to learn something only the locals know (like that creepy headless guy who rides his horse around the neighborhood). It can be extremely hard to not be shy when you’re in a new place. But friendliness is a trait that will serve you every time you move. Follow Casper’s lead by being overly friendly! Whether in the grocery store, in the drop-off line at school, or somewhere on base, make a point of smiling at others and exuding an air of approachability. This overt friendliness allows you to strike up conversations with folks, learn about the area, and even make some friends! Don’t forget! As you start meeting new people and familiarizing yourself with your neighborhood, don’t forget to be yourself! As Aggie Cromwell asserts in Halloween Town, being you is part of what makes this world so wonderful. Stay true to yourself and the right friends will find you. 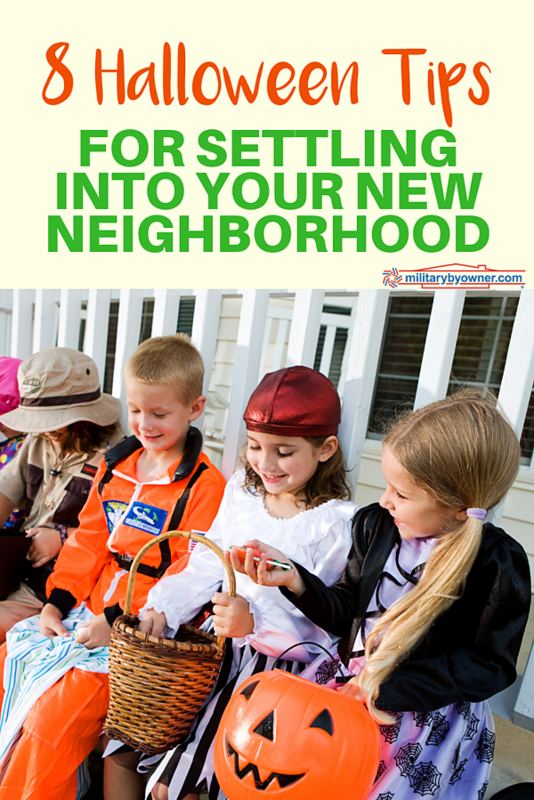 We hope these tips help you settle into your new neighborhood. If nothing else, now you have an awesome Halloween movie list for October. Enjoy! MILLIE is an online community and digital marketplace that connects members of the military and their families with specialized knowledge and trusted resource providers to remove the stress and anxiety of PCSing. Check out MILLIE’s Installation and Neighborhood Guides, our network of Veteran and military spouse Realtors, and Scout, our on-demand task service composed of military spouses. Find out more at www.gomillie.com and don’t forget to find us on Facebook.